“Estelle Porter: Quiltworks” open on Sunday, April 14, from 3-5pm, and runs through June 9, 2019. Gallery Hours are 10-4pm Monday-Friday (211 N. Center St.). Porter is an accomplished fiber artist with strong ties to Randolph-Macon. Her fiber art is the culmination of training in a variety of media. 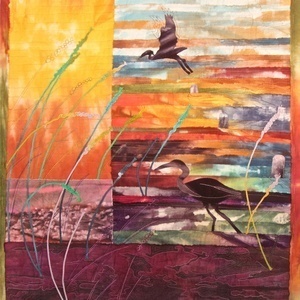 She incorporates painting, drawing, photography, and printing, along with fiber art techniques, to achieve a variety of surface design effects on cloth. Recent work reflects her rediscovery of family connections to the Greek island of Kythera. “Estelle’s quilts explore her connection to place and history and reveal her creative interest in surface design and process. Through painting, stenciling, dyeing, and photographic printing, Estelle manipulates and embellishes her fabrics to create spontaneously artful quilts that hold together as colorful collages.” says Kristen Peyton, gallery director and curator. Flippo Gallery is open Monday – Friday 10 a.m. – 4 p.m. or by appointment. Contact Kristen Peyton at kristenpeyton@rmc.edu for more information or for special appointments. The opening reception and exhibition are free and open to the public.